All of this social interaction on the web today really supports consumers in each of their purchase or engagement decisions. We talk about social commerce as if it were something new. There has always been a social element to commerce – in every sphere we rely on others to help inform our purchase decisions. What is new is the efficiency with which this social influence process can now happen thanks to blogs, forums and social networks such as Twitter and Facebook. Friends, family members and co-workers typically have the most immediate impact on our purchase decisions on a daily basis. Consumers are connected to many of their personal networks online and the new movement in social commerce sees brands enabling individuals tap into the experiences and recommendations of friends in order to drive sales. We also tend to rely on the recommendations of people with whom we share an interest (in social media, sport, music etc). Thanks again to social tools we can now easily connect with people that we have never met but with whom we enjoy interacting, because they are passionate about the same things that we are. Since the web offers unprecedented choice, consumers regularly find themselves presented with choices that no one in their personal or social networks has the previous experience to help them with. The anonymous ratings and reviews left by other customers are increasingly valuable in this world of seemingly endless options. Friends, people with shared interests and other customers may not always have the deep knowledge of a product or service that is adequate to help us make up our mind. Consumers tend to trust the views of independent experts especially on complex purchases or where a high degree of commitment is involved. Let’s not forget about the impact of celebrities on consumer decision-making. Celebrities, in all walks of life, represent aspirations that have been fulfilled. We naturally like to identify with people who represent success in whatever spheres are important to us. Celebrities have never been so accessible and indeed many now see social media engagement as central in supporting their fan bases. Finally, since individual employees of organisations often hold greater sway amongst consumers than the corporate advertising or communications activities of brands, they are a greatly untapped resource. Google recently demonstrated that this realisation when it announced that it has given a social media mandate to every single employee. Influence is complex. Each purchase or engagement decision will rely on a different mix of social and other influencing factors. One thing is certain; as the fabric of society changes thanks to ever-evolving communications capabilities, sales and marketing people would be foolhardy to ignore the dynamics of social influence. Well done, and congrats on FP-ed! Hang on for the ride! I agree wholeheartedly. I think that a lot of the local businesses in my area would benefit from engaging their employees on social media. People need that human touch and social media can add it in a new and wide-reaching way. It always makes me sad that celebrities are included on the list of social influencers. I realize they’re certainly there…I just wish we as a society had more lofty influences than those provided by Justin Bieber! couldn’t agree more. not that I’m pleased with all of it…the celebrity thing sort of disgusts me but most of us are guilty of feeding into it in some way. I am not sure I want to interact with employees of a business in the social network realm because I would never be sure of their intentions. Are they doing it because they like me or because they have to per the boss? At least at a store, you know they have to so they can get the sale and are trying to make the experience more plesant for both sides. I agree. It is kinda sad how easily we are influenced by these different factors. I think you nailed it! Well done. Great analysis! It saddens me to see some long-standing local brick&mortar businesses, with seemingly strong business models, get swept away larger companies simply because they have not yet grasped the power of social commerce in the modern age. Best of luck to you and congrats on FP! Why would I want to have influence? As long as people leave me alone, I am fine. Well, I wouldn’t say this as the entire spectrum of influence. There could also be personal choice. Some people might choose NOT be influence by society and rather live in a simple and contented way. It all depends on each indivisual. Why did you make “People with common interests” another pillar. How would you define it, how do you recognize them? Doesn’t friends and customers cover it? Mikalee and Eva on celebrities – in every walk of life we have people we aspire to be like – they have achieved a perceived state of existence that we would like. Perhaps the term celebrity today has taken on an overly superficial tone – e.g. we think Justin Bieber, but a great scholar, artist, engineer or musician can achieve celebrity status. Notesfromrumbleycottage on employees – CrystalSpins makes a good point about the opportunity for employees to present a more human face to a business. You are right to be cynical though as many businesses may enable their employees to tweet or blog, but may not actually improve the service they offer customers. However, if you are to engage in a meaningful way in social media, you will ultimately find that you have no choice but to improve your service as customers will have their say. Alive aLwaYs – I think the ‘people with common interests’ represent a type of person that we interact with that are neither people we class as friends or who may not necessarily be existing customers. The internet enables us to connect with people with shared interests from anywhere around the world. Meeting these people in independent forums (such as through the WordPress network for example) gives us scope to have meaningful conversations about topics and products that we might not have with our friends or colleagues. I like the chart, how you made it ? I agree, social influences on buying habits have always existed, it’s just the way we get the input. Getting information from people, especially people we don’t personally know, is much easier in the internet and social media era. I definitely agree with Jing Hu: the six pillars you wrote about really describe social influence the best way possible, but I believe personal choice still plays the most important role in every decision we make. Aside from this I think it is amazing to see how the web made indipendent experts become a necessary step in each of our complex purchase. You really made me think about it: would I really buy a smartphone without asking an expert online? I believe most people would answer no 🙂 Thanks for the interesting facts! I can see this being in a textbook one day. Excellent post. If you ever have time, stop by our news site! You mentioned, “Friends, family members and co-workers typically have the most immediate impact on our purchase decisions on a daily basis.” Yes, very true. If your friend saw the movie and loved it, then you will most likely go see it. If your co-worker tells you about a new restaurant they had a good meal and great service at, you will probably eat there also. WOM (word of mouth) advertising is the best form of spreading the word on just about every product or service out there. Thanks for the great blog. Good insight. I usually ask the opinion of family and friends regarding a purchase, aside from other information on the web from people who share the same interest. I never thought about the others. Very interesting. Cool perspective on this! Definitely useful, look forward to reading more. I totally agree with the celebrity thing. I can’t tell you how many people come in and want a certain look that they saw on a celebrity. And when you show them a lip gloss and tell them….this is so and so’s gloss….they buy it in a heartbeat. I agree with what you are saying and i guess the intelligent comments above are proof of the fact that both as consumers and marketeers we have begun to pay a lot more attention to consumer behaviour and what influences it. Your Six pillars are bang on target… Despite the glaring realities, some companies still choose to ignore these while formulating their marketing strategies and thus loose out on tapping potential consumers and bigger and profitable business in the end. The key to growth is to understand the people who you want to associate with and know what makes them tick. Hmm, interesting topic. I wonder if this influences people’s decisions with healthcare choices as well? I know that family definitely would, but also how people learn of a good doctor in the neighborhood might be through other moms at the soccer field or an “expert” review on the internet. celebrities… and public figure in common. in social-media, we have unique definition for a profile that create influence for others. they have followers, rich in links and easy to find, even we don’t search it. Good post apart form being pillar of social influence these are are the people who make impact on or life a we deal will them day to day. Well said! I like your take on this. Congratz on FP! I agree with many of the commenters here that I prefer to make up my own mind. The most influential are people I know and trust, whose budgets and priorities are similar. The last thing I want — I agree with Crystal on this — is some company trying to be my social media pal. Enough already! 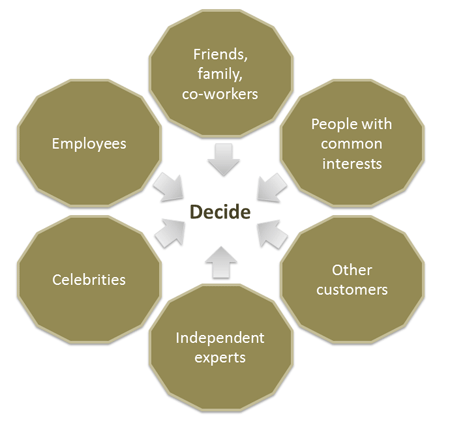 One of the more interesting looks into influence and the decision-making process is Buyology by Martin Lindstrom (http://bit.ly/h3UBAO). Your analysis is absolutely on-target with some of his findings. It’s an interesting subject area that’s getting traction amongst many publishers. It might clarify things if you used a popular term for people with common interests. Although it’s a colloquial way of putting it, being a ‘fan’ seems like the social relationship that you’re describing. The point of contact is only the subject of shared interest, yet that alone provides fellowship and forms a community. Sports fans will recognize instantly when they see the trappings of another enthusiast whether they are friend or foe. Also, jargon is a marker for fans of any genre. When meeting for the first time, fans will exchange cues that will reveal and confirm their mutual interest. Fans personify the old saying, “Birds of a feather, flock together”.